SCVHistory.com | Valley Industry Association | Program Book: VIA Bash, 11-8-2014. Program Book: 2014 VIA Bash. History of "Connecting to Success." 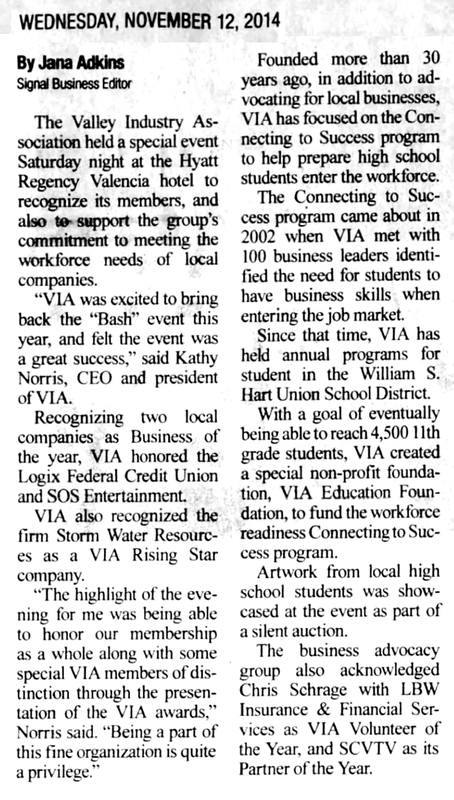 In March of 2002 the Valley Industry Association [then known as the Valencia Industrial Association] conducted its bi-annual CEO Forum, focused on Education. Nearly 100 business leaders met to discuss training and retraining needs for existing employees, as well as educational needs for the emerging workforce. An overwhelming theme for "Basic Business Conduct" skills emerged, identifying the need for entry level employees entering the workforce to be equipped with fundamental skills and work ethics. Specifically, this included interviewing skills with appropriate dress, punctuality, clear and concise communication and interpersonal skills, job responsibility, teamwork and customer service understanding. Verbal and written communication skills, problem solving, decision-making, organizational skills and strategic level thinking were also desired. Soon afterward, the Valley Industry Association Education Committee met to discuss and develop a means to satisfy these important needs. A training program for high school aged students was strongly suggested. In an effort to move forward with solutions, the Education Committee reviewed portions of Junior Achievement's Success Skills program and found it had much to offer. Unfortunately, the program was too lengthy for local high schools to add to an already aggressive curriculum. The VIA Education Committee wanted to consider the possibility of amending the program into an intensive training, off-site "seminar" for high school students and scheduled a planning session with representatives from Junior Achievement. Through a very special collaboration between the VIA Education Committee, Junior Achievement, and local educators, "Connecting to Success" was born. Designed as a three subject, day long "seminar" pilot program loosely based on "Success Skills" and the needs of local business leaders, the program was presented to several hundred juniors from Valencia High School in November of 2003. Facilitated by local business professionals, Connecting to Success provides a value to students they wouldn't ordinarily access. This training is offered by their future employers and presents unique insight into the world of work. The 2003 Connecting to Success program involved the entire junior class at one local high school, with 500 students in attendance. Each year, the program has expanded in the sheer number of participating students and the demand from other Santa Clarita Valley high schools to be included in the program. The 2014 program, representing the twelfth year of Connecting to Success is currently in process. Nearly 2,500 students from the William S. Hart Union High School District are participating, requiring three days to cover all the students wishing to attend the program. Over the years, job fairs and internship competitions have often been added to the day's activities, helping students get a jump start on their entry into the world of work. Since 2003, we've watched Connecting to Success develop in a variety of other areas, and even other states. We are extremely proud to have piloted such a successful program right here in Santa Clarita. The program continues to grow, with additional high schools added each year. Sixty to eighty business professionals participate in the training process each season. Connecting to Success is truly an advantageous training program for our future workforce. In order to effectively manage the remarkable growth of this program, the Valley Industry Association realized a stand-alone 501c3 nonprofit organization would be necessary to support the program. In 2007, the VIA EDUCATION FOUNDATION was born. Since that time, the foundation has been successful in receiving grants for the program from entities such as Southern California Edison, Citibank, The Newhall Foundation, US Bank, State Street Foundation and others. Contributions from the business community of the Santa Clarita Valley have also helped the program grow. The Valley Industry Association's ultimate goal is to ensure that every high school junior within the Santa Clarita Valley experiences the Connecting to Success program. The innovative seminar has become a national model, and in other formats is now being offered in various cities across the nation. The entire cost of the Santa Clarita Valley program is covered through local support and grants garnered by the Valley Industry Association. As the program continues to grow, budgetary concerns grow as well. Each year the program has grown, with an ultimate objective to reach all 4,500 11th graders in the Santa Clarita Valley. This growth increases programs costs dramatically each year. With that in mind, VIA created a special, not for profit foundation, the VIA Education Foundation (Tax ID No. 45-5239130) to align ourselves for educational grant opportunities. In addition, both the VIA Education Foundation and the Valley Industry Association work hard to fund this important workforce readiness program through grants, special fundraising events and corporate and personal contributions. For more information, please contact Kathy Norris, CEO/President of the Valley Industry Association: (661) 294-8088 or by email: kathy@via.org. The Signal | Wednesday, November 12, 2014. The Valley Industry Association held a special event Saturday night at the Hyatt Regency Valencia hotel to recognize its members, and also to support the group*s commitment to meeting the workforce needs of local companies. "VIA was excited to bring back the Bash event this year and felt the event was a great success," said Kathy Norris, CEO and president of VIA. VIA also recognized the firm Storm Water Resources as a VIA Rising Star company. "The highlight of the evening for me was being able to honor our membership as a whole along with some special VIA members of distinction through the presentation of the VIA awards," Norris said. "Being a part of this fine organization is quite a privilege." Founded more than 30 years ago, in addition to advocating tor local businesses, VIA has focused on the Connecting to Success program to help prepare high school students enter the work force. The Connecting to Success program came about in 2002 when VIA met with 100 business leaders identified the need for students to have business skills when entering the job market. Since that time, VIA has held annual programs for student in the William S. Hart Union School District With a goal of eventually being able to reach 4,500 eleventh grade students, VIA created a special non-profit foundation, VIA Education Foundation, to fund the workforce readiness Connecting to Success program. Artwork from local high school students was showcased at the event as part of a silent auction. The business advocacy group also acknowledged Chris Schrage with LBW Insurance & Financial Services as VIA Volunteer of the Year, and SCVTV as its Partner of the Year.